GRANDER® Circulation Units are suitable for the use in heating/cooling circuits and process water systems. They are available as in-line units and double-cylinder submersion units and can be installed in homes and apartments, middle-size as well as large industrial plants. 1/2", 3/4", 1", 5/4", 6/4", 2", 2 1/2", 3", 4"
GRANDER® Circulation Units are available in flow units and in double cylinder models. The GRANDER® effect is clearly visible here: dirty and often foul-smelling heating water becomes crystal clear in a short time. Through the implementation of GRANDER® water revitalization, stabilized process water by consistent optimization of chemical use can be achieved. for prevention of contact corrosion. For the correct unit selection, the individual situation is important. Individual counseling is done by trained GRANDER® consultant. 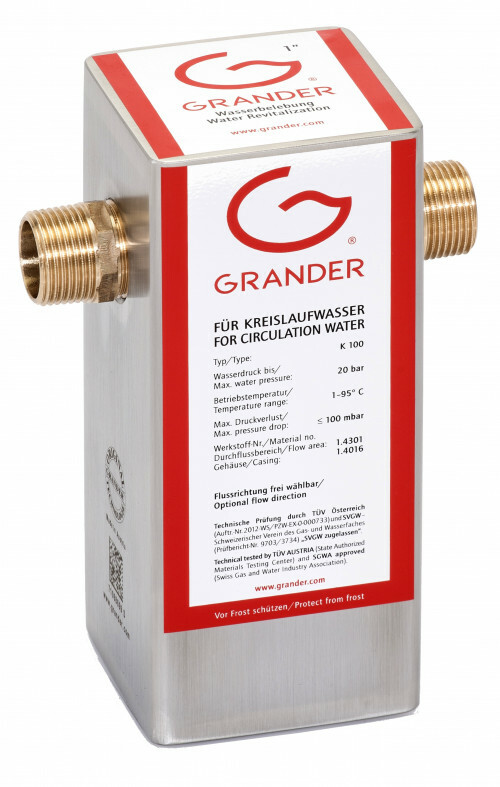 GRANDER® Circulation Units should not be used in drinking water! The installation should be done, particularly in high temperature systems, in return flow after a possible dirt separator and to guarantee a problem-free system ventilation in a vertical pipe. GRANDER® Circulation Units work with natural energy, without electricity or chemicals and are completely service-and maintenance-free. GRANDER® Circulation Units are manufactured in durable high quality V2A stainless steel, which ensures a long life span. For special applications, devices (from ¾\") are available in acid resistant stainless steel V4A. The GRANDER® Energy Rods Circulation Double are produced in V4A stainless steel.